I'm frustrated that I've not managed much blog time (and certainly not WOYWW) for ages, so here goes. We're living in the aftermath of Mum's 90th last week (previous post) but things are getting back to normal, especially now that DH has returned to the new term now. It's lovely to have him home, but it's good to get on with things. 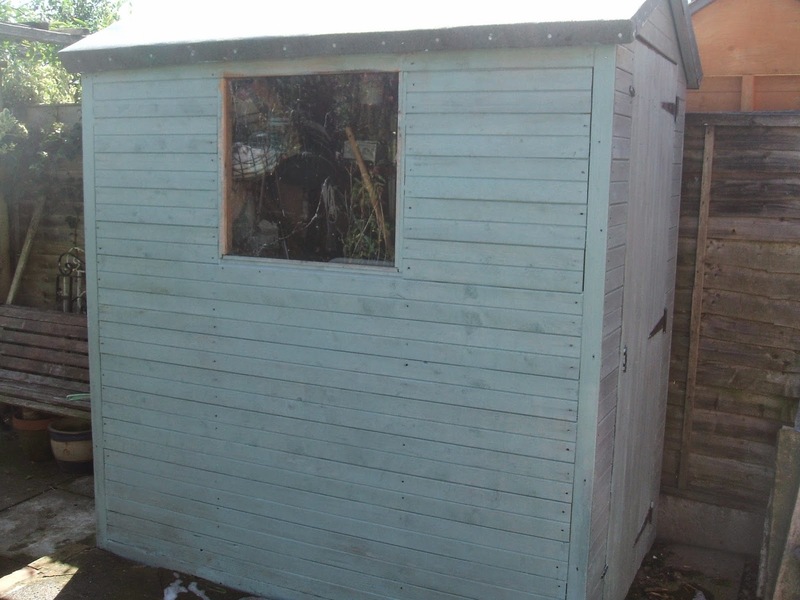 So, today I set to work on the old garden tool shed, giving it a coat of paint. If the weather holds, tomorrow it will have a second coat, and I plan to make some bright curtains, too. Indoors, I've started to knit my first pair of socks and, after a rocky start, I now love doing them. This pair is for DD2, for Christmas. 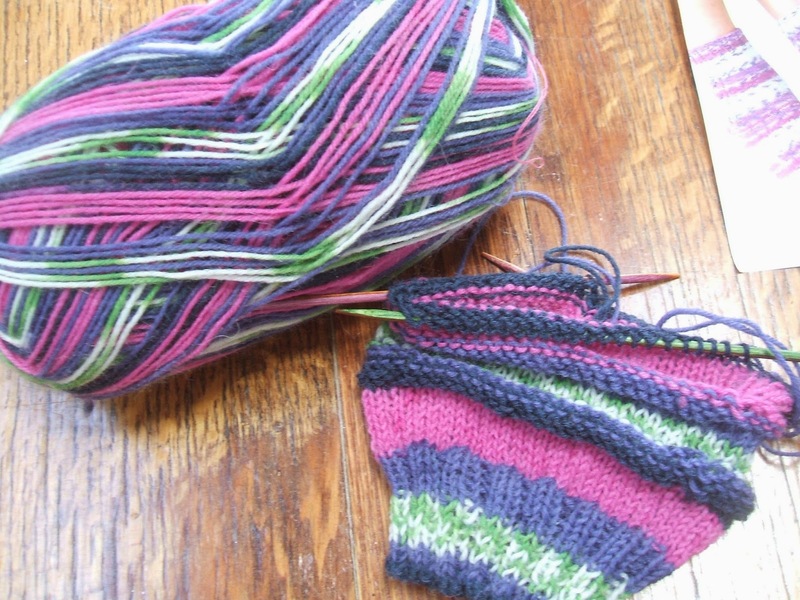 I've used Zig Zag sock yarn (4 ply) which is very reasonable, compared to others, at £4.something per 100g, and I should get this pair of slouch socks from one ball. I did start this lacy pair but found learning to knit on 4dpns as well as the pattern, just too complicated. Also, since the yarn knits up in stripes, the lace didn't show up. I might try these ones later, in a plain colour where the lace would be more visible. I finished the ten strips of bunting in time, for friends to take to Uganda, to do fabric painting on, with children in the orphanage our church supports. 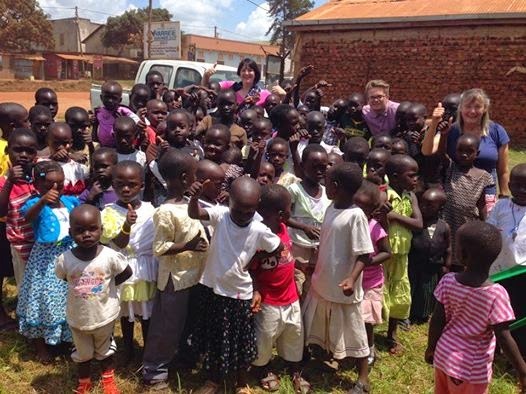 These are some of the kids and a few of the team, when they arrived a couple of weeks ago. Anyway, I'd better sign off for now and get to bed, and just encourage you to pop over here to Julia's, to see what WOYWW is all about, and see what other crafting has been going on. I'll try to visit as many folks there as I can, by the weekend. Hi Chris, I so want to knit socks! I've started some but of course I got distracted! Will be interested to see how you go with yours. I think your time has been so well spent you shouldn't beat yourself up for not blogging too! It is lovely to hear about it all though! Is the shed going to be a crafting shed? Loving the socks! Hello Chris. I like the colour you are painting that shed - very fetching. Are the curtains for that as well? There's posh! Socks - golly. 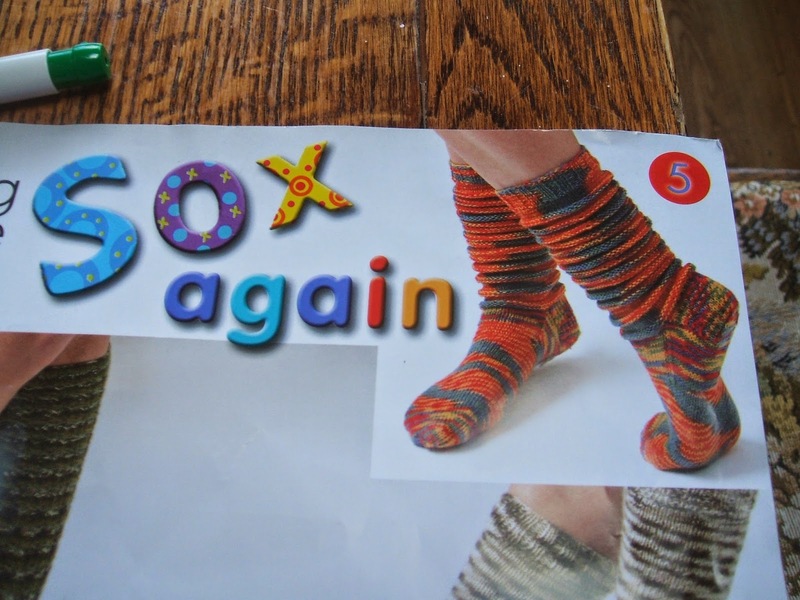 I don't think I have ever knitted a pair of socks - but lots of folk do seem to. Have knitted gloves on four needles, though - not hard to learn, so I'm sure you will master it effortlessly. That's a beautiful picture of those children in Uganda. Our church supports Parental Care Ministries in Uganda - they really are good looking youngsters out there, aren't they? 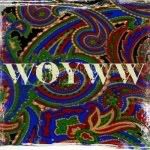 Hi Chris, I've linked into WOYWW for the first time and I'm happily snooping around. What a coincidence: we've recently celebrated my mum's 90th too. I've been making a digital photobook of the photos. I'm a Christian too so I shall look forward to seeing that side of your crafting. Thank you for sharing your desk. Love the socks Chris and look forward to seeing them finished. los goin gon here inside and out! beautiful children and socks! Yep, I'm with you - sock patterns need to be easy but made with cool yarn. One day I hope I can figure out how to do the two-socks at the same time on joined needles (? or that is what I remember - DOH! NOW I have to go look in to THAT! Maybe MIL can sort me out when she visits... Liking the slouch :) mine slouch even when they aren't designed to so bette to aim for that in the beginning LOL! Knitting socks is something I don't think I will ever do, are they warmer than normal socks like explorer socks for example. I see so many of the desker's knitting them that are in colder countries and have always wondered. Wow 90 Years young what a milestone and I thought my dad turning 81 was good. I hope you have a wonderful week filled with crafting. Well, you are one busy crafter-of-all-trades! The socks will look so cool. Fun wool! Oooh, lots of lovely things to look at on your desk today :-) I love that brightly coloured yarn, it's going to make a groovy pair of socks! You have more patience than me though.....knitting with 4 needles....shudders.....I'd be all fingers and thumbs! And look at hat lovely burning too...that's a sight to gladden my heart! Love the gold ribbon, nice touch. Your socks are gorgeous. I have made them in the past, but lacy knitting is beyond me, I'm afraid! It always ends up looking like something the moths have got at! Lovely bunting for Uganda, too. Thanks for your visit and your lovely comment about my card - so glad you liked it. 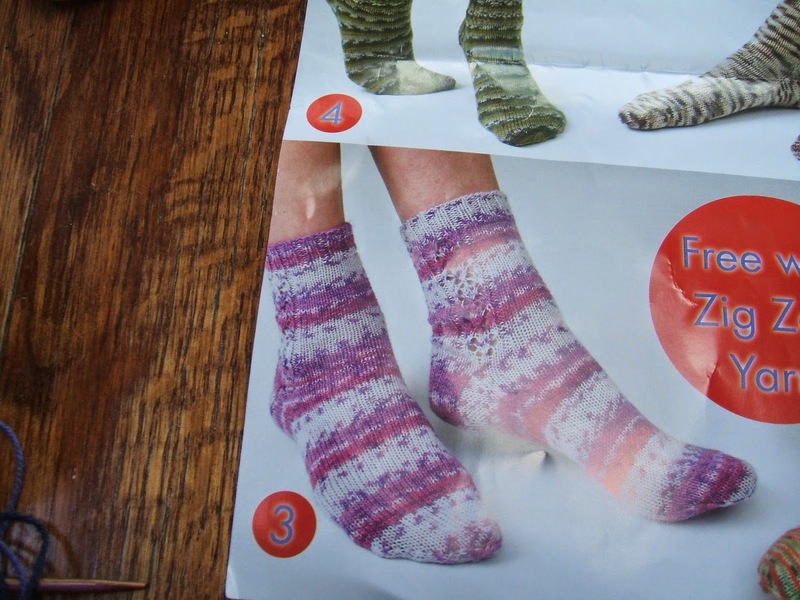 That is so cool that you can knit socks!! I think it's a lost art these days. And how clever to make bunting for kids to paint. Happy belated WOYWW and thanks for popping by. You have so many awesome projects going on! 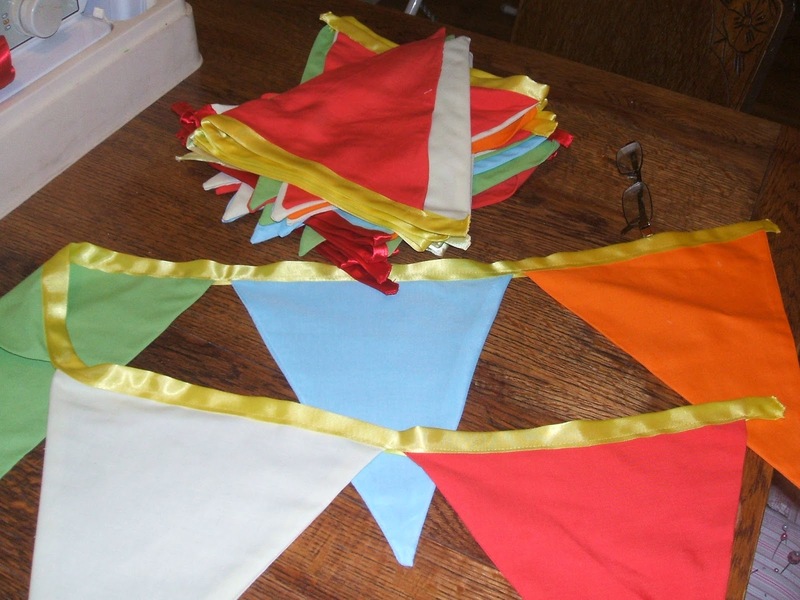 I would love to see the finished buntings - so cool! Thanks for visiting and happy belated WOYWW! Ya look pretty busy having fun. I like your knitting project. I knit since I was nine but had to put down the needles so now I paint. I love seeing others carry on the craft. Thanks so much for visiting this week. Those whimsical socks look so fun, that I'm sure my youngest daughter who's very artsy would love. As to the banners, I'm sure they'll touch the lives of those children in Uganda in some priceless manner. Blessings to you, your missionary friends, and those sweet children! Oh your socks are adorable! I can't wait to see them finished! 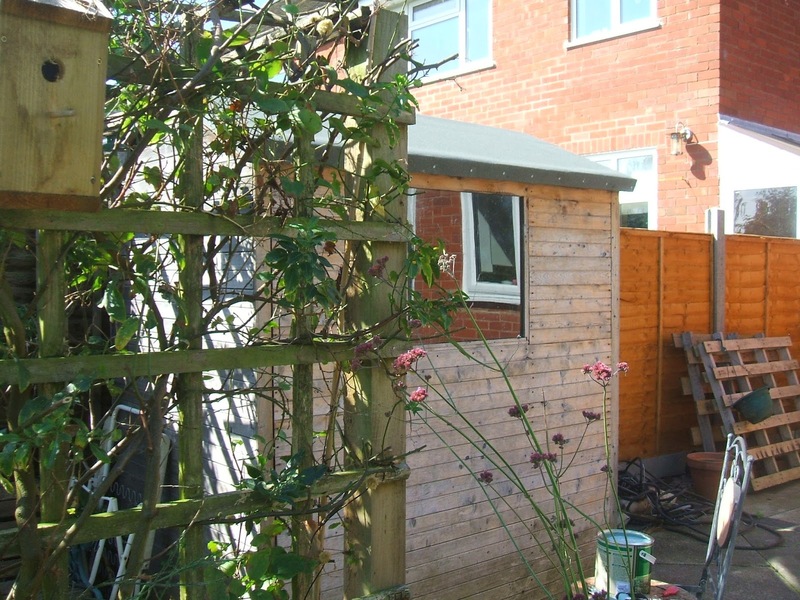 And your shed too!